Most octopi squirt thick clouds of black ink to confuse predators. This video from a Japanese TV quiz show, however, shows a type of Tremoctopus, or blanket octopus (murasakidako in Japanese), employing a different technique. 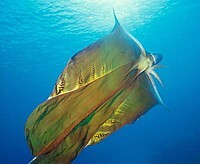 The video explains that when threatened, the octopus unfurls a giant sheet of webbing that trails behind like a cape. The webbing breaks apart rather easily when attacked -- much like a lizard's tail -- and it gets wrapped around the predator's face, giving the octopus a chance to flee. once its gone, can it grow another one??? ?